Tourism in Sri Lanka has positively exploded within the past few years, with the island rapidly becoming a “must-visit” on both the backpacker route and more luxe travellers bucket list. 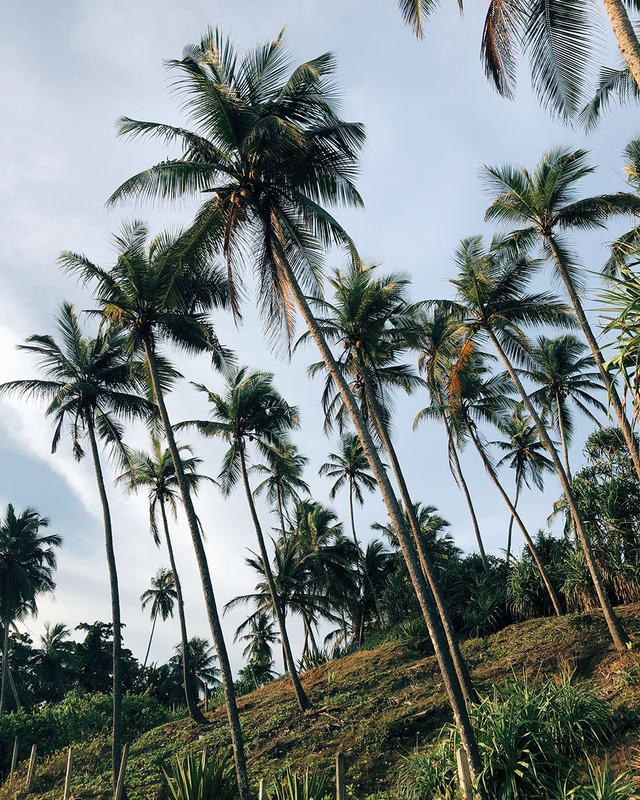 While the north and east regions of Sri Lanka have become much-reported on destinations to visit since the end of the civil war in 2009, it was the serene, sandy southern beaches that captured our attention and set the backdrop for a week-long tropical escape. 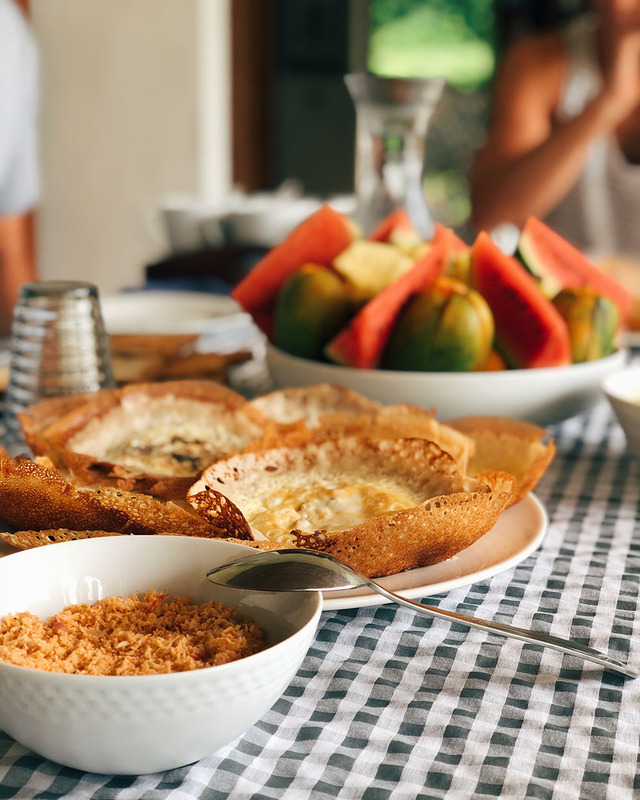 You will quickly learn in Sri Lanka, that navigating the island can take some serious lengthy travel times – often complete with careening local buses and questionable road rules. Private drivers are the recommended mode of transport and the service will cater to your personal itinerary of venturing around the island. We opted to drive directly south out of Colombo to our destination of choice, Hiriketiya Bay – a roughly 4 hour journey, taken by private car along a recently finished, modern highway. Once you find a base, like Hiriketiya Bay, local Tuk-Tuk’s are the cheapest and most accessible mode of transport for shorter distances. Hiriketiya Bay is an idyllic, palm tree lined horseshoe cove complete with warm turquoise waters, shady shacks selling beachside cocktails or local roti and surfers dotted along the gentle offshore break. 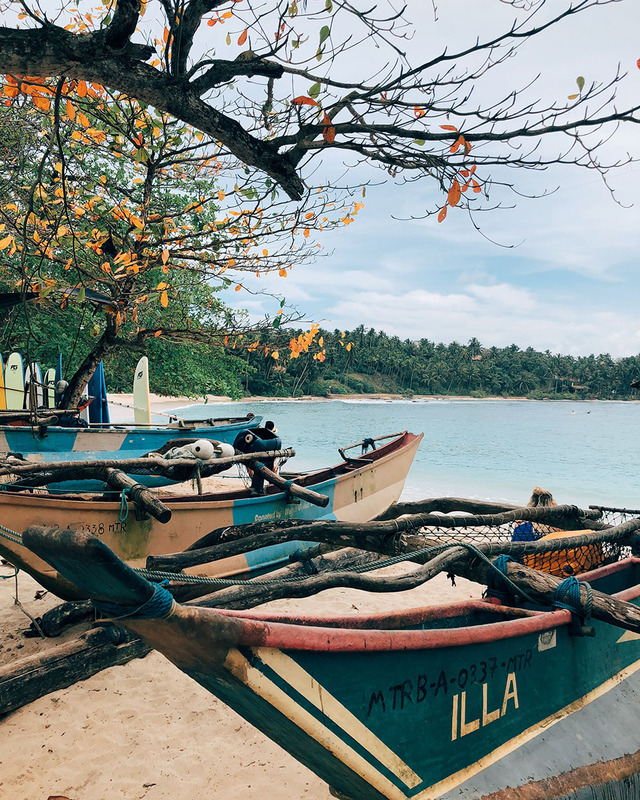 Nestled along the southern edge of Sri Lanka, just a short ride from the fishing port town of Dikwella, the area has recently gained favour among tourists, with a handful of Aussie’s and Kiwi’s settling into town and setting up local businesses, support the traditional community. Though don’t worry - it is still relatively unspoiled, unlike other destinations it is oft compared to, such as Canggu. The pace here is relaxed and the atmosphere is uncomplicated. As you move from yoga, to surf, to lounging on the beach, there is little to do bar soaking up some sun-rays, reading a book and working your way through the menu’s of the three or four eateries in the tiny town. If it is a slow, unwinding break you need, find a hideaway along Hiriketiya Bay and give yourself a dose of island time. Wetakeiya House is a relaxed, elegant guest house in a prime position along the southern coast, providing dramatic, undisrupted views out to the Indian Ocean. Surrounded by coconut palms, the 3 ensuite, bedroom property, is outfitted with plenty of spaces to lounge, relax or curl up with a book. Just a mere 5 minute stroll down the hill to Hiriketiya Bay, the villa features a plunge pool and access to the rocky cliffs of the ocean’s edge below (though swimming is not advised in the rough rips) and a sense of seclusion allows you to feel comfortably isolated as you unwind during your stay. Staffed by a couple, living on site in separate residences, who can prepare traditional, local meals including vibrant vegetarian curry spreads for evening meals and egg hoppers for breakfast. Owned and operated by a warm and welcoming Aussie/Kiwi Duo, Salt House is a guest house, restaurant and Yoga shala that sits within the paradise cove of Hiriketiya. Daily morning yoga sessions, commonly led by owner and Vinyassa practitioner Crystal, take place within the open-air, jungle facing, elevated Yoga shala, offering sightings of local monkey’s playing in the palms and a gentle breeze, cooling you off from the asana practice. Flowing within such a space, brings forth an easy attitude of gratitude and groundedness, connecting you to nature and the good fortune of being immersed within such a beautiful, natural environment. From the Salt duo you will also find a fish and chip store – Squids – and a second guest house – Pepper – close by. 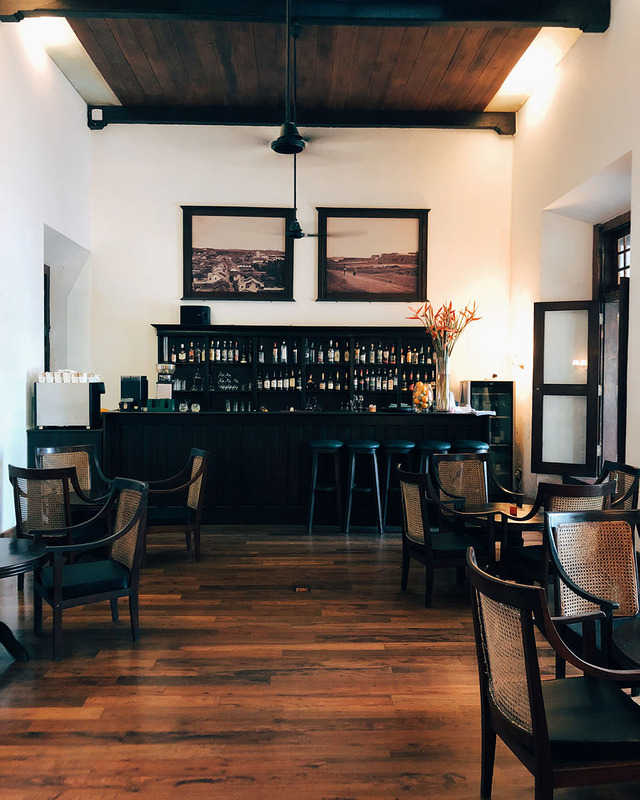 When you need a good coffee, head straight to The Grove, which is the pick of the bunch for dining options in the area (especially if you’re not experiencing home-made traditional Sri Lankan meals, which are a common bonus of booking a guest house villa). The European/Australian inspired menu utilises fresh local produce -particularly fresh off the boat seafood – in their all-day dining options. Don’t miss out on the fish taco’s – we are still drooling over them! Sometimes after a session in the salt water, all you want is a wood-fired pizza while you watch the ocean roll in. And when that feeling comes, thankfully you have Marty’s to provide the ocean-front location and feeds. Nothing is fancy, but expect a crispy, hot pizza to fill you up after a paddle in the waves. The offshore break at Hiriketiya Bay is welcoming to both total rookies and experienced surfers alike. You will also find a bevvy of locals paddling out for a session and all were exceptionally welcoming to this here grom! 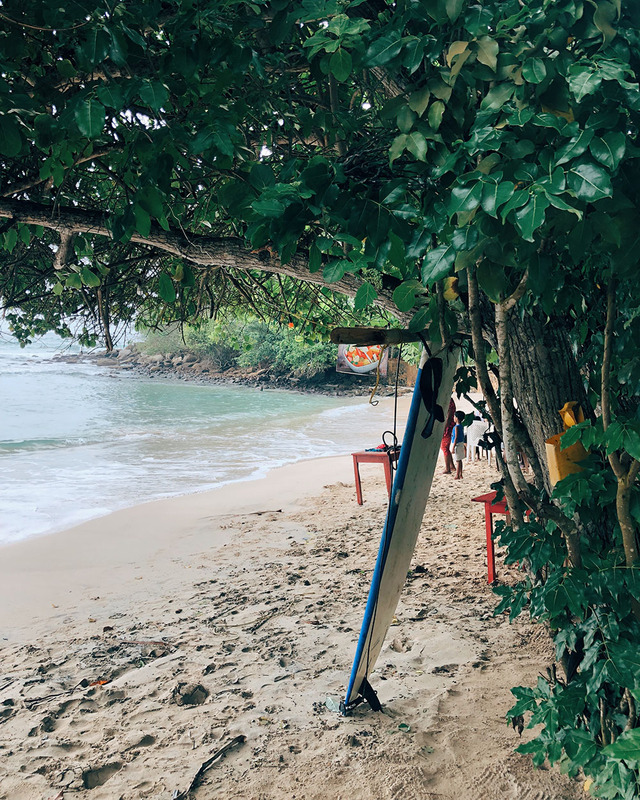 Renting a surfboard from one of the many hire locations along the bay is roughly $5 SGD for an hour or there is the option for lessons to take place too! While Hiriketiya is still a relatively untouched pocket of paradise, the popularity of the bay is slowing growing and when it comes around to sunset, Happy Hour at Dot’s is where the find the traveller crowd. Set just off the sandy shore in amongst the jungle, this buzzing bar fills up under the open-air fairy lights and you’ll soon find the local business owners and tourists mingling at the end of a big day in the surf. You can also find Yoga sessions at 8am or 4pm daily, alongside a menu for dining options at Dot’s. 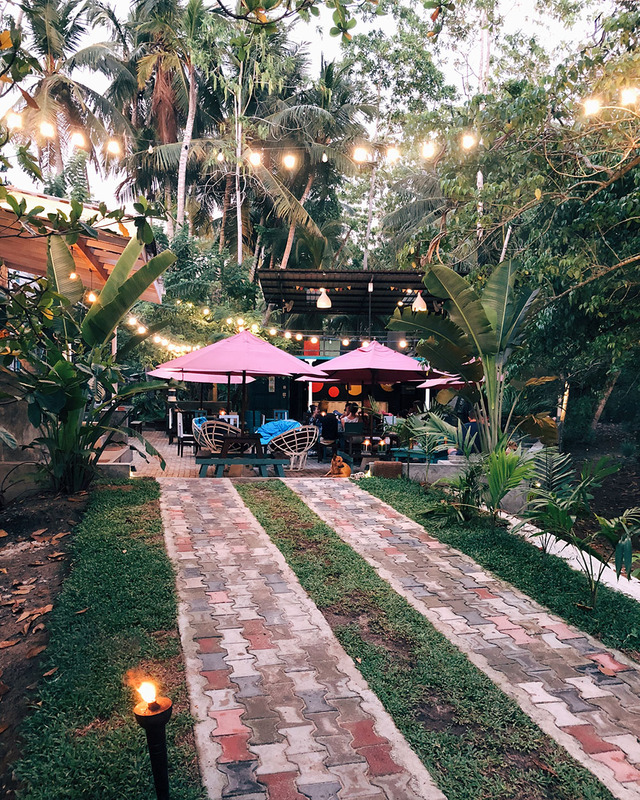 Set a little further towards Dikwella from Hiriketiya Bay, Verse Collective is a café, co-working space and hostel accommodation trifecta that feels similarly like numerous outposts in Canggu, Bali. Amongst the digital nomads pulling up a lounge or bar stool in the expansive co-working space, you can find the sea-facing café whipping up a fusion of locally inspired meals in the modern, concrete garden that even features a mini half-pipe. From the renowned luxurious Aman Hotel group, Amanwella resort is a 5-star estate, hidden along the southern coast further along from Hiriketiya towards Tangalle. Claiming its 150m pool overlooking the pristine Amanwella beach below, to be one of the world’s most talked about, Amanwella is certainly a showstopper. Exuding tropical minimalism pared with exclusive elegance, the resort is sophisticated, sleek and modern and sets the scene for a spectacular sundowner at cocktail hour, if you’re not quite ready to shell out for the entire stay. Galle is a walled fort city colonised by Dutch settlers, which sit around 2 hours south of the main transport link to Sri Lanka of Colombo (roughly 1.5 hours from Hiriketiya Bay). Flattened by the 2004 tsunami, the stone fortress walls ring the inner city, which now houses upscale boutique hotels, alongside local stores, restaurants and many a tuk-tuk driver. Taking around 20 minutes the cruise the outer perimeter, you can find a spot to settle in to watch the sunset dip low over the ocean horizon or sneak a peek at the infamous crazy jumpers. If touristing is your thing, you can find historical landmarks at the lighthouse, maritime museum or for sports fans – the international cricket ground. The sophisticated, comfortable elegance of the residence, featuring a buzzing veranda lounge bar and plunge pool, is echoed with the gentile service of the ever-attentive staff who will may your stay a memorable experience. Another outpost and luxury resort from the Aman group, the Amangalla is a historically significant landmark within Galle Fort. In it’s yesteryear the Dutch Colonial 17th century building was the New Oriental Hotel during the peak of steamship travel, these days, it serves as the 5 star, luxurious escape for the discerning traveller. For those not quite looking for the price tag attached to such grandeur, even a visit to the Amangalla for a luxurious take on traditional fare, while perched atop the beautiful balcony restaurant with flawless service, will fulfil your 5 star desires. I've created this FREE e-book just for you so that you can reap the benefits from the simple act of taking the time to stretch out and cool down after a workout. As a holistic PT and Pilates coach, far too often I saw the detrimental effects of clients skipping out this fundamental aspect of your overall fitness routine. This is a fast-track to injury, postural misalignment, and more PAIN! But no fear, as I'm here to bring you the ultimate cool-down routine and stretch guide, full of tutorial style "how-to" stretches and tips that will help you get the most from this practice. All you need to do is fill out your details below! You're here because you're ready to invite more space and length into your body, whilst cultivating a pause for your mind. Soon a confirmation email will land in your inbox (make sure to check your junk folder too!) with the link for your e-book! Be sure to click on it to download.